Dee Clark - How About That! Earlier this year, guitarist Tony Iommi sparked rumors of a Black Sabbath reunion and then dashed them just as quickly, blasting a British newspaper for printing comments he'd made in confidence about an in-the-works comeback album. Now, it seems that iconic frontman Ozzy Osbourne is getting in on the act, hinting that the seminal English metal foursome might be fixing to rise from the tombs. Quickly approaching the 20th anniversary milestone of their classic album called 'Achtung Baby,' U2 have recruited an impressive collection of musical friends for a compilation of cover versions of each track on the record. The covers album, entitled AHK-toong BAY-bi Covered, will arrive for free - bundled with Q Magazine's 25th anniversary issue, on October 26th. 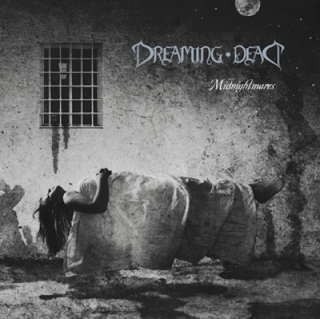 California death metal trio DREAMING DEAD are readying to unleash their long-awaited new full-length, entitled Midnightmares. The follow-up to their 2009 Within One opus, was recorded from June through September of this year. All guitars and bass were tracked at the band's own studio in downtown Los Angeles while the drums and vocals were tracked at Architeuthis Sound. HOLLYWOOD, Calif., Oct. 10, 2011 /PRNewswire/ -- The world's best-selling, multi-artist album series, NOW That's What I Call Music!, is celebrating unparalleled success and a milestone release with its 40th numbered volume. On November 8, NOW That's What I Call Music! Vol. 40 will be released in single-disc and deluxe 2CD packages. Both configurations will also be available for download purchase from all major digital service providers. NOW That's What I Call Music! Vol. 40 features 16 current major chart hits from today's hottest artists, including Britney Spears, Rihanna, Maroon 5 featuring Christina Aguilera, Foster The People, David Guetta featuring Usher, and more, plus four up-and-coming "NOW What's Next" New Music Preview tracks. The Deluxe Edition adds a bonus disc with 16 more smash hits showcasing many of the top artists featured in the NOW series to date, including Katy Perry, The Black Eyed Peas, P!nk, Lady Gaga, and more. The "NOW What's Next" bonus track program featured on each numeric NOW release continues to preview hot new artists with tomorrow's biggest hits. NOW 40 showcases up and coming tracks from Trevor Hall, Neon Hitch, Lil Playy Featuring Matthew Koma, and V V Brown Featuring Chiddy. The NOW That's What I Call Music! series is a joint venture from EMI Music North America, Sony Music Entertainment, and Universal Music Group. NOW That's What I Call Music! Vol. 40 will be distributed by EMI Music North America. NOW and NOW That's What I Call Music! are registered trademarks of EMI (IP) Limited. In 1998, the NOW That's What I Call Music! series debuted in the U.S. after the brand had been a multi-platinum international success for 15 years. The series has generated sales exceeding 200 million albums worldwide, including more than 80 million copies in the U.S. Every album in the numeric U.S. series has reached Billboard's Top 10, and 15 NOW releases have reached #1, second only to The Beatles in chart history. NEW YORK, Oct. 10, 2011 /PRNewswire/ -- Wines That Rock, innovators of rock inspired wines, announced today the launch of the Grateful Dead "Steal Your Face Red Blend" to join the brand's four established rock 'n' roll varietals; Rolling Stones "Forty Licks Merlot," "Woodstock Chardonnay," The Police "Synchronicity Red Blend" and Pink Floyd's "The Dark Side of the Moon Cabernet Sauvignon." Wines That Rock began releasing the labels in 2009 and a portion of the proceeds from every bottle sold are donated to the T.J. Martell Foundation. Grateful Dead Productions and Rhino Entertainment have partnered with Wines That Rock to create the "Steal Your Face Red Blend." Wines That Rock is a partnership between legendary rock business managers RZO and award-winning winemakers Mendocino Wine Co., to capture the quality and spirit of rock 'n' roll mythology in its portfolio of great tasting wines, iconic album art for labels, earth friendly production and great consumer value. Wines That Rock are crafted from the hands and vision of Mendocino Wine Co. winemaker Mark Beaman, whose talent and passions are quality, sustainability and pure rock 'n' roll. The process for making "Steal Your Face" began by listening and discovering the vibe and intricacies of the band during their legendary multi-night performance at San Francisco's Winterland Ballroom in 1974. "To capture the essence of the live energy for Grateful Dead's 'Steal Your Face,' we chose to meld several varietals into one," said Beaman. "Just as the band members would segue through various musical styles, this wine's far reaching flavors melt seamlessly from one to the next. In honor of the Grateful Dead's famous improvisational concerts that have brought joy to so many, this wine celebrates diversity and freedom of experimentation." Wines That Rock takes its respect for music very seriously, with founders that have been at the forefront of bringing rock 'n' roll to millions of fans for decades. Co-founders Ron Roy and Howard Jackowitz originally partnered with RZO and David Bowie in 1997 to create UltraStar Entertainment, the world's largest online fan club company pioneering fan club ticketing and online artist communities. UltraStar's clients range from the New York Yankees to AC/DC, Madonna and The Who. "As Wines That Rock continues to grow its portfolio of well-priced, award-winning wines and expanding retail distribution throughout North America and Europe, we felt it was only appropriate to introduce a varietal that represents one of the most important moments in our music history and celebrate one of that era's most influential bands," said Roy. "Grateful Dead encompass so much of what the 60's and 70's meant to our culture through music, and were truly the first band to establish a worldwide sense of community through their live shows – they were really all about the experience. With Grateful Dead, we have found the perfect partner." "We love the idea of using the Grateful Dead's music to guide the winemaking process," said Mark Pinkus, GM of Grateful Dead Properties at Rhino Entertainment. "Wines That Rock's passion for the band really shows in how hard they worked to reflect the mood and essence of the recordings." The Grateful Dead "Steal Your Face Red Blend" made its official public debut October 6th, 2011 and is currently available for order at www.winesthatrock.com and at more than 1,500 retail locations worldwide. Available directly from its website, Wines That Rock offers variety packs of all current varietals and a collectors T-Shirt ($69), as well as three-bottle packs ($49). Wines That Rock will offer the Grateful Dead "Steal Your Face Red Blend" in three, six and 12-bottle packs at around $16.99 per bottle. Individual bottles are competitively priced at your local retailer. Former Weezer bass player Mikey Welsh has been found dead in a hotel room in Chicago. A report in the Chicago Tribune claims that police found prescription drugs and a bag of white powder believed to be heroin in Welsh’s hotel room and, although the official cause of his death is still to be determined, they suspect narcotics were involved. Welsh joined Weezer in 1998 and made his live debut with the band in 2000. He departed in 2001, seeking treatment amid a reported nervous breakdown, seeking treatment in a psychiatric hospital later that year. He went on to a new career as a successful visual artist, with work appearing on Burton snowboards. Weezer also paid their own respects on their Twitter account Twitter.com/Weezer, writing: "We are shocked and deeply saddened to hear the awful news, our friend and fellow Weezer rocker @mikeywelsh71 has passed away. We love you Mikey." In 1902, the Gibson Mandolin Company opened its doors. In 1939, the real Eleanor Rigby died in her sleep of unknown causes at the age of 44. The 1966 Beatles' song that featured her name wasn't really written about her, as Paul McCartney's first draft of the song named the character Miss Daisy Hawkins. Eleanor Rigby's tombstone was noticed in the 1980s in the graveyard of St. Peter's Parish Church in Woolton, Liverpool, a few feet from where McCartney and Lennon had met for the first time in 1957. In 1956, Elvis Presley's "Love Me Tender" entered the Billboard chart for a 19 week stay. It was #1 for 5 of those weeks. The song, from Presley's first film of the same name, was adapted from the tune "Aura Lee", written in 1861. In 1959, Berry Gordy's first release on the newly established Motown Records, "Bad Girls" by The Miracles, enters the Billboard Pop chart. Unfortunately for all concerned, it will only stay there for two weeks, then fade into oblivion. In 1962, the BBC banned the song "Monster Mash" by Bobby "Boris" Pickett. In 1964, during a UK tour the Beatles appeared at De Montfort Hall in Leicester. Ringo Starr drove himself to the venue after taking delivery of a brand new Facel Vega, apparently reaching speeds of 140 MPH on the M6 motorway. 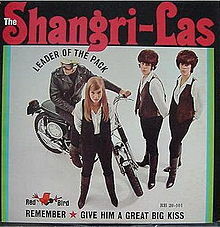 The Shangri-Las released "Leader Of The Pack" on this date in 1964 and the song hit number one on the Billboard Hot 100 on November 28, 1964. This was written by Ellie Greenwich, Jeff Barry and producer Shadow Morton. The sound of the motorcycle was the engineer's Harley Davidson. However, in an interview four decades later, Shangri-Las lead singer Mary Weiss said the motorcycle sound was taken from an effects record. The vocals were dubbed over the instrumental parts which had been previously recorded at the Ultrasonic Recording Studios in Hempstead, New York. Billy Joel, then a young session musician, claimed on November 16th, 2010 during an interview with Howard Stern that he played piano on one of the demos for "Leader of the Pack" and is not sure if any of his parts made the final recording. In fact, the piano part was played by Roger Rossi, a staff musician for Ultrasonic Recording Studios at the time. Rossi said, "I remember the date like it was yesterday, there were no written charts, so unfortunately, some musicians kept making mistakes. 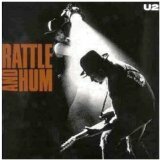 As I recall, it took 63 recording takes before Shadow Morton was satisfied." In the United Kingdom, the song was refused airplay by the BBC, probably due to its death theme, although some have speculated that it was considered likely to encourage violence between mods and rockers. It charted three times: #11 in 1965; #3 in 1972 (by which time the BBC ban had been lifted); and once again at #7 in 1976 when its sales figures as a reissue on two different labels (Charly and Contempo) were combined to arrive at its chart position. The record also reached number 1 in Australia. In 1990, it featured in the soundtrack of the Martin Scorsese film Goodfellas. In 2004, Rolling Stone ranked the song among the 500 Greatest Songs of All Time, at #447. In 1970, Neil Diamond's "Cracklin' Rosie" topped the Billboard singles chart. The song was actually inspired by a story that Neil heard on a trip to an Indian reservation and has nothing at all to do with wine. In 1970, FCC Commissioner Nicholas Johnson responded to Vice President Spiro Agnew's charge that rock music drives young people to drugs, by playing rock music during a speech, saying that Agnew would do well to listen to song lyrics to understand what's happening around the US. In 1970, Smokey Robinson and The Miracles' "Tears Of A Clown" was released. By December, it will top both the Billboard Pop and R&B charts as well as the Cashbox Best Sellers list. In 1979, a motion picture called 'The Rose,' starring Bette Midler as a self-destructive 1960s rock star, (transparently based on Janis Joplin) premiered in Los Angeles. The film was nominated for four Academy Awards including Best Actor in a Supporting Role (Frederic Forrest), Best Actress in a Leading Role (Bette Midler, in her screen debut), Best Film Editing and Best Sound. In 1980, the funeral took place of Led Zeppelin's drummer John Bonham. “Bonzo” was found dead at guitarist's Jimmy Page's house of what was described as asphyxiation, after inhaling his own vomit after excessive vodka consumption, (40 shots in 4 hours) aged 32. In 1987, the three members of ZZ Top made advance bookings for seats on the first passenger flight to the Moon. In 1999, a charity auction selling Elvis Presley's belongings was held at The Grand Hotel in Las Vegas. His wristwatch sold for $32,500, a cigar box for $25,000, an autographed baseball sold for $19,000 and his 1956 Lincoln Continental went for $250,000. In 2006, Mark David Chapman was told by a parole board that he must serve at least another two years in Attica Correctional Facility for murdering John Lennon. "While the panel notes your satisfactory institutional adjustment," the decision said, "due to the extremely violent nature of the offence, your release would not be in the best interest of the community." In 2010, Solomon Burke, a pioneering Soul singer and Rock and Roll Hall of Fame inductee, died at Amsterdam's Schiphol airport after a flight from Los Angeles. He was 70 years old.